██ Extent of Kingdom of Mysore, 1784 C.E. The Kingdom of Mysore (Kannada ಮೈಸೂರು ಸಾಮ್ರಾಜ್ಯ ) (1399–1947 C.E.) was a kingdom of southern India founded in 1399 by Yaduraya in the region of the modern city of Mysore. The kingdom, ruled by the Wodeyar family, served as a feudatory of the Vijayanagara Empire until the empire's decline in 1565. Later, during a period when multiple feudatory rulers claimed independence in southern India, the Kingdom of Mysore consolidated. Under the rule of kings Narasaraja Wodeyar and Chikka Devaraja Wodeyar, the kingdom annexed large parts of what is now southern Karnataka and became one of the powerful ruling families in the region. The kingdom reached the peak of its military power in the late eighteenth century under de-facto rulers Haider Ali and his son Tipu Sultan, when it came into conflict with the Maratha Empire, the British Empire, the Nizam of Golconda and the rulers of Travancore and Malabar. Tipu Sultan’s defeat in the fourth Anglo-Mysore war resulted in the British taking over large parts of the kingdom, and ended Mysorean hegemony over the southern Deccan. The British, however, restored the kingdom to the Wodeyars whom they saw as the rightful heirs to the throne, and it became a 'princely state' under the British Raj until Indian independence in 1947, when the kingdom was merged with the Union of India. Under the Mysore Kingdom, the fine arts flourished in southern India. The Mysore court, which patronized such famous artists and musicians as Veena Sheshanna and T.Chowdiah, became a center of Carnatic music. During this period, Mysore painting, Indo-European architecture and Kannada literature, including writings on both traditional religious themes and topics such as musical treatises, drama and theatre, developed significantly. Many Mysore kings were acclaimed writers and composers, and both the kings themselves and the classical artists they patronized had a lasting effect on the culture of southern India. Sources for the history of the kingdom include inscriptions, written records in the Mysore palace and contemporary literary sources in the Kannada language, such as the Kanteerava Narasaraja Vijayama and the Chikkadevaraja Vamshavali. Except for legends, however, the origins of the kingdom remain obscure. The first mention of the Wodeyar family is in sixteenth century Kannada literature from the time of the Vijayanagara king Achyuta Deva Raya, while the Mysore kingdom's own earliest available inscription is from the rule of the petty chief Timmaraja II in 1551. It is known that the kingdom originated as a small state based in the modern city of Mysore and was founded by two brothers, Yaduraya (also known as Vijaya) and Krishnaraya. The origin of the brothers, though, is still a matter of debate, with some historians claiming a northern origin at Dwaraka, while others claim a local Karnataka origin. The kings who followed Yaduraya ruled as vassals of the Vijayanagara empire until the decline of the latter in 1565, when Raja Wodeyar I asserted his independence and sovereignty. Raja Wodeyar I was followed by Chamaraja Wodeyar V and Raja Wodeyar II. In 1637, the celebrated Narasaraja Wodeyar, known for his valor, skill in wrestling, and his interest in the fine arts, came to power. A popular account of Narasaraja Wodeyar recounts his victory over a champion wrestler of Tiruchirapalli. He is said to have proceeded incognito to Trichy, defeated the wrestler and left quietly without accepting any gifts from the local ruler, instead leaving a note that read "someone from Mysore has defeated the wrestler". The diminished Vijayanagara empire that ruled from Vellore had folded completely by this time, and the Kingdom of Mysore experienced unprecedented expansion, covering significant areas of what is now southern Karnataka, up to the Satyamangalam region bordering modern Tamil Nadu. Even the invading armies of Bijapur, under the leadership of the formidable commander Ranadullah Khan, were repelled by the Mysore armies. The next famous king of the dynasty was Chikka Devaraja Wodeyar, who further expanded the kingdom between Chikkamagaluru in the north and Salem in the south, prompting claims that he was the most important of Mysore's early rulers. Evidence indicates that even the Maratha emperor Shivaji was unwilling to fight a pitched battle with Chikka Devaraja Wodeyar during the 1677 siege of Srirangapatna. His successes against the Marathas of Gingee and against the combined armies of Maratha Sambhaji, Keladi and Golkonda at Banavara in 1682 are clearly documented. However, controversy exists regarding his battle against the Moguls. 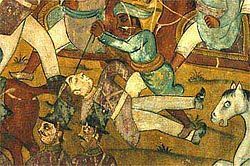 Mogul records indicate that the Mysore kingdom was forced to accept feudatory status following the Mogul invasion of Bangalore territory, but Mysore palace records claim that Chikka Devaraja Wodeyar defeated the Mogul commander Khasim Khan at Bangalore on July 10, 1687. Chikka Devaraja Wodeyar earned the title Apratima Veera for his leadership and administrative skills. During the six decades following the death of King Chikka Devaraja Wodeyar, the kingdom declined, as local bureaucrats and powerful noblemen (Dalavoy) taking its administration into their own hands. Chikka Devaraja Wodeyar was followed by King Narasaraja Wodeyar II, who remained silent throughout his rule. His silence has sparked controversy among historians as to whether the king was mute or simply preferred to perform his duties in sign language and written communication. Either way, his silence did not appear to hinder the performance of his duties. He was followed by Krishnaraja Wodeyar I and Krishnaraja Wodeyar II, kings in title only, as the administration was taken over by the powerful Kalale brothers, Dalavoy Nanjarajaiah and Sarvadhikari Devarajaiah (Prime Minister). During the latter part of the rule of Krishnaraja Wodeyar II, Haider Ali, a captain in the army, rose to prominence. His victory against the Marathas at Bangalore in 1758, resulting in the annexation of their territory, made him an iconic figure. In honor of his achievements, the king gave him the title "Nawab Haider Ali Khan Bahadur." Though illiterate, Haider Ali earned an important place in the history of Karnataka for his fighting skills and administrative acumen. By 1761, the Maratha menace had diminished and by 1763, Haider Ali had captured the Keladi kingdom, defeated the rulers of Bilgi, Baidanur and Gutti and extended the Mysore kingdom up to Dharwad and Bellary. Between 1766 and 1796, Mysore was ruled by Nanjaraja Wodeyar, Chamaraja Wodeyar VII and Chamaraja Wodeyar VIII, who, like their immediate predecessors, were kings in title only. An alliance against Mysore had been formed by the Marathas, the Nizam of Golconda and the British, culminating in the first Anglo-Mysore war in 1767. The war was a victory for Haider Ali, who drove the British up to modern Chennai and dictated peace terms. By 1779, Haider Ali had captured parts of modern Tamil Nadu and Kerala in the south, extending the Kingdom's area to about 80,000 mi² (205,000 km²). Haider Ali befriended the French and by 1780 made alliances with the Marathas and the Nizam, only to be betrayed by them in a crucial war in the Tamil region. He died as fighting continued with the British, and was succeeded by his son Tipu Sultan. Tipu continued hostilities against the British in the second Anglo-Mysore war. Tipu, popularly known as the "Tiger of Mysore," defeated the British in Wandiwash in 1783, but lost some regions in modern coastal Karnataka to them. He also lost the Kittur, Nargund and Badami territories to the Marathas. Tipu's attack on the Kingdom of Travancore, a British ally, resulted in the third Anglo-Mysore war. By 1792, the British besieged Srirangapatna, resulting in Tipu's defeat. Half his territories were seized and two of his sons were taken hostage. A humiliated but indomitable Tipu formed an alliance with the French, the Amir of Afghanistan and the Sultanate of Turkey, while the British were backed by the Marathas and Nizam of Golconda. In 1799, Tipu died fighting in the fourth Anglo-Mysore war, heralding the end of the Kingdom's independence. Modern Indian historians consider Tipu Sultan an inveterate enemy of the British, an able administrator and an innovator. 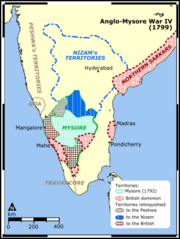 Following Tipu's fall, a part of the kingdom of Mysore was annexed and divided between the Madras Presidency and the British vassals. The remaining territory was formed into a princely state and the five-year-old scion of the Wodeyar family, Krishnaraja Wodeyar III, was installed on the throne by the British. Because the king was a minor, the administration was run by Purniah, the first Diwan (minister) of Mysore. Mysore paid an annual tribute to the British Raj and a subsidy for maintaining a standing British army at Mysore. As Diwan, Purniah earned praise from the British for his progressive and innovative administration. In 1811, he retired from service following the sixteenth birthday of the boy king. In 1831, dissatisfied with the economy of the princely state and citing mis-administration, a situation brought about by corrupt local officials (tashildars), the British took direct control of the kingdom. King Krishnaraja Wodeyar III spent most of his time encouraging the fine arts, resulting in the development of Carnatic music and Kannada literature. For the next 50 years, Mysore was subject to the rule of commissioners, who were British-appointed officials. In 1876–1877, towards the end of the direct British rule, Mysore was struck by a devastating famine with estimated mortality figures which ranged between 700,000 and 1,100,000, or nearly a fifth of the population. Shortly thereafter, King Chamaraja Wodeyar, who had been educated in the British system, took over the Mysore administration in 1881, following the success of a lobby set up by the Wodeyar dynasty. From then onwards, until Indian independence in 1947, Mysore remained a princely state under the British Raj with the Wodeyars continuing their rule. After the demise of King Chamaraja Wodeyar IX, King Krishnaraja Wodeyar IV, still a boy of eleven, ascended the throne in 1895. His mother, Maharani Kemparajammanniyavaru, ruled as regent until Krishnaraja Wodeyar took over the reins on February 8, 1902. Under his rule, with Sir M. Vishweshwariah as his Diwan, the king set about transforming Mysore into a progressive and modern state, particularly in industry, education, agriculture and art. Mysore was so successful that Mahatma Gandhi called the king a Rajarishi (a saintly king). Paul Brunton, the British philosopher and orientalist, John Gunther, the American author, and British statesman Lord Samuel praised the king's efforts. Much of the pioneering work in educational infrastructure that took place during this period would serve Karnataka invaluably in the coming decades. The king was an accomplished musician, and like his predecessors, avidly patronized the development of the fine arts. He was followed by his nephew Jayachamaraja Wodeyar who proved a worthy successor in the years leading up to Indian independence. The rule of the Wodeyar dynasty came to an end when Mysore joined the Indian union following the instrument of accession signed by Jayachamaraja Wodeyar on August 9, 1947. There are no records relating to the administration of the Mysore territory during the Vijayanagara Empire's reign (1399–1565). The first sign that the kingdom had established itself in the area was the issuing of gold coins (Kanthirayi phanam) resembling those of the erstwhile Vijayanagara Empire during Narasaraja Wodeyar's rule. The kingdom's financial position improved further during the rule of King Chikka Devaraja Wodeyar, who increased the value of the Treasury to 90,000,000 Pagoda (a unit of currency) and founded the Attara Kacheri, the central secretariat comprising 18 departments. During Haider Ali's rule, the kingdom was divided into five provinces (Asofis) of unequal size, comprising 171 Paraganas (taluks) in total. When Tipu Sultan became the de facto ruler, the kingdom, which encompassed 160,000 km² (62,000 mi²), was divided into 37 Asofi and a total of 124 taluks (Amil). Each Asofi had a governor, or Asof, and one deputy Asof. The taluk was headed by an Amildar and a Patel was in charge of a group of villages. The central administration comprised six departments headed by ministers, each aided by an advisory council of up to four members. When the kingdom came under direct British rule in 1831, early commissioners Lushington, Briggs and Morrison were followed by Mark Cubbon, who took charge in 1834. He made Bangalore the capital and divided the princely state into four divisions, each under a British superintendent. The state was further divided into 120 taluks with 85 taluk courts, with all lower level administration in the Kannada language. The office of the commissioner had eight departments; revenue, post, police, cavalry, public works, medical, animal husbandry, judiciary and education. The judiciary was hierarchical with the commissioners' court at the apex, followed by the Huzur Adalat, four superintending courts and eight Sadar Munsiff courts at the lowest level. Lewin Bowring became the chief commissioner in 1862 and held the position until 1870. During his tenure, the property "Registration Act," the "Indian Penal code" and "Code of Criminal Procedure" came into effect and the judiciary was separated from the executive branch of the administration. Rangacharlu, a native of Chennai, was made the Diwan. Under him, the first Representative Assembly of British India, with 144 members, was formed in 1881. He was followed by Sheshadri Iyer in 1883, during whose tenure gold mining at the Kolar Gold Fields began; the Shivanasamudra hydroelectric project was initiated in 1899 (the first such major attempt in India); and electricity and drinking water (the latter through pipes) was supplied to Bangalore. Sheshadri Iyer was followed by P.N. Krishna Murthy, who founded The Secretariat Manual to maintain records and the Co-operative Department in 1905,V.P. Madhava Rao, who focused on conservation of forests; and T. Ananda Rao, who finalized the Kannambadi Dam project. Sir M. Visveshwarayya, popularly known as the "Maker of Modern Mysore" or the "Father of modern Mysore state," holds a key place in the history of Karnataka. An engineer by education, he became the Diwan in 1909. He was the chief engineer responsible for the construction of the Krishna Raja Sagara dam across the Kaveri River as well as the chief designer of the flood protection system for the city of Hyderabad. Under his tenure as Diwan, membership of the Mysore Legislative Assembly was increased from 18 to 24, and it was given the power to discuss the state budget. The Mysore Economic Conference was expanded into three committees; industry and commerce, education, and agriculture, with publications in English and Kannada. Important projects commissioned during his time included the construction of the Kannambadi Dam, the founding of the Mysore Iron Works at Bhadravathi, founding of the Mysore University in 1916 and the Visveshwarayya College of Engineering in Bangalore. The Bangalore Press and the Mysore Bank were also established during his tenure. 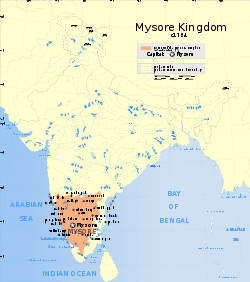 The economy of the kingdom was based on agriculture, due to the fact that majority of Mysore’s people were villagers. The agrarian population consisted of landlords (gavunda, zamindar, heggadde) who tilled the land by employing a number of landless laborers, usually paying them in grain. Minor cultivators also hired themselves out as laborers if the need arose. Due to the availability of these landless laborers, kings and landlords were able to execute major projects such as palaces, temples, mosques, anicuts (dams) and tanks. Because land was abundant and the population relatively sparse, no rent was charged on land ownership. Instead, landowners paid tax for cultivation, which amounted to up to one-half of all harvested produce. Tipu Sultan is credited with founding state trading depots in various locations of his kingdom. In addition, he founded depots in foreign locations such as Karachi, Jeddah and Muscat, where Mysore products were sold. During Tipu's rule French technology was used for the first time in carpentry and iron working; Chinese technology was used for sugar production, and technology from Bengal helped improve the sericulture industry. State factories were established in Kanakapura and Taramandelpeth to produce cannons and gunpowder respectively. The state held the monopoly in the production of essentials such as sugar, salt, iron, pepper, cardamom, betel nut, tobacco and sandalwood, as well as the extraction of incense oil from sandalwood and the mining of silver, gold and precious stones. Sandalwood was exported to China and the Persian Gulf countries, and sericulture was developed in 21 centers within the kingdom. The economic revolution in England and the tariff policies of the British also caused massive de-industrialization in other sectors throughout India and Mysore. For example, the gunny bag weaving business had been a monopoly of the Goniga people, which they lost when the British began ruling the area. The import of a chemical substitute for saltpeter (potassium nitrate) affected the Uppar community, the traditional makers of saltpeter for use in gunpowder. The import of kerosene affected the Goniga community which supplied oils. Foreign enamel and crockery industries had an impact on the native pottery business and mill-made blankets replaced the country-made blankets called kambli. This economic fallout led to the formation of community-based social welfare organizations to help those within the community to cope with their new economic difficulties, by providing services such as youth hostels for students seeking education and shelter. The British economic policies created a class structure consisting of a newly established middle class comprising various blue- and white-collared occupational groups, including agents, brokers, lawyers, teachers, civil servants and physicians. Due to a more flexible caste hierarchy, the middle class contained a heterogeneous mix of people from different castes. The Mysore royalty are generally known to have been Hindu Vaishnavas and the goddess Chamundeshwari, a manifestation of the goddess Durga, was their family deity. 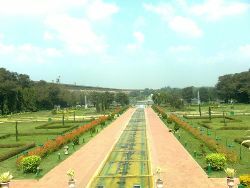 The rise of the modern day Mysore city as a centre of south Indian culture has been traced from the period of their sovereignty. Raja Wodeyar I initiated the celebration of the Dasara festival in Mysore, a proud tradition of the erstwhile Vijayanagara royal family. However, the kings were tolerant to other sects and religious faiths. This is evidenced by the high ranking non-Vaishnavites in their courts, including Kalale Nanjarajaiah, a staunch Shaiva, who served under King Krishnaraja Wodeyar I, and Haider Ali, a Shia Muslim who rose to power and received much adulation in the court of Krishnaraja Wodeyar II. Jainism, though in decline during the late medieval period, also enjoyed the patronage of the Mysore kings, who made endowments to the Jain monastic order at Shravanabelagola. This patronage may have been in part due to the friendship between the Mysore royal family and some Jain noble families, including the Urs and Paleygars, and also the fact that some Mysore queens were Jains. Inscriptions from 1634 prove that the Mysore kings made munificent grants for the renovation and restoration of Jain monoliths and temples. King Chamaraja Wodeyar IV made a grant of four villages to the pontiff of Shravanabelagola and brought him back from Gerosoppa, where the pontiff had taken refuge to escape the wrath of a local tax collector. In 1611, Raja Wodeyar I began an annuity of 3000 rupees for the maintenance of the Gomateshwara monolith and 33 other Jain temples in the area. The incumbent king of Mysore either performed the Mahamastakabhisheka or presided over it in the years 1672, 1675, 1800, 1925, and 1940. In 1830, King Krishnaraja Wodeyar III donated five villages in and around Shravanabelagola to the Jain monastic order. The contact between South India and Islam goes back to the seventh century, when trade between Hindu kingdoms and Islamic caliphates thrived. These Muslim traders settled on the Malabar coast and married local Hindu women, and their descendants came to be known as Mappillas. By the fourteenth century, Muslims had become a significant minority in the south, though the advent of Portuguese missionaries checked their expansion.Haider Ali, though a devout Muslim, did not allow his faith to interfere with the administration of the predominantly Hindu kingdom. Historians are, however, divided on the intentions of Haider Ali's son, Tipu Sultan. It has been claimed that Tipu raised Hindus to prominent positions in his administration, made generous grants to Hindu temples and Brahmins, and generally respected other faiths, and that any religious conversions that Tipu undertook were as punishment to those who rebelled against his authority. 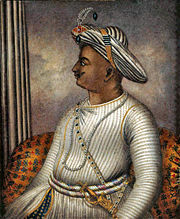 However, this has been countered by other historians who claim that Tipu Sultan treated the non-Muslims of Mysore far better than those of the Malabar, Raichur and Kodagu regions, and that Tipu was responsible for mass conversions of Christians and Hindus in these regions, either through offering them tax incentives and revenue benefits, or by force. The spread of Christianity in South India has been traced back to the arrival of the Portuguese on the west coast. It was through the patronage of these Roman Catholics that chaplains and missionaries were sent to various regions to encourage people to join the Christian faith. Some evidence, however, suggests that not all of these conversions were peaceful, and that the Portuguese soldiers may have undertaken coercive methods to achieve their ends. Francis Xavier (1506 – 1552), perhaps the most respected Christian saint in India, traveled from village to village, healing the sick, burying the dead and doing what he could to reduce the miseries of the poor and underprivileged. The institutions established in his name are a testimony to his popularity and achievements. Lo Cinnami, a Jesuit from Goa, was the founder of the Mysore mission. The Portuguese patronage, called Padraodo, was suppressed by the Propaganda of the more hostile European powers, including the English, the French, the Dutch and the Danes. The Propaganda sent out Capuchins, the Discalced Carmelites, the Theatines and the missionaries of the Society of Paris. The foundation of the Protestant church in India was laid by the Danish settlement at Tranquebar. Ziegenbalg and Plutschan were the first missionaries to arrive in 1709, under the patronage of King Frederick IV of Denmark. The best known Lutheran missionary connected with the Danish royal mission was Rev. Christian Frederick Schwartz (1750 - 1798). After his death, the Lutheran Church declined and was absorbed by the Anglican Church, whose reach became significant after the rise of British power in India in the nineteenth century. Prior to the eighteenth century, the society of the kingdom followed age-old and deeply established norms of social interaction between people. Accounts by contemporary travelers indicate the widespread practice of the Hindu caste system and of animal sacrifices during the Mahanavami nine-day celebrations. Later, fundamental changes were brought about by the struggle between native and foreign powers. Though wars between the Hindu kingdoms and the Sultanates continued, the battles between native rulers (including Muslims) and the newly arrived British, took center stage. The spread of English education, the introduction of the printing press and the criticism of the prevailing social system by Christian missionaries helped to make the society more flexible. The rise of modern nationalism throughout India also had an impact on Mysore. With the advent of British power, English education gained prominence, in addition to traditional education in local languages. These changes were orchestrated by Lord Elphinstone, the governor of the Madras Presidency. His plan became the constitution of the central collegiate institution or University Board in 1841. Accordingly, a high school department of the university was established. In the interior regions, schools were raised in principal towns and were eventually elevated to college level, with each college becoming central to many zilla schools (local schools). The earliest English-medium schools appeared in 1833 in Mysore, and spread across the region. In 1858, the department of education was founded in Mysore and by 1881, there were an estimated 2,087 English medium schools in the Kingdom of Mysore. Higher education became available with the formation of Bangalore Central College in Bangalore (1870), Maharaja's college (1879), Maharani's college (1901) and the Mysore University (1916) in Mysore and the Saint Agnes College in Mangalore (1921). The Mysore territory was influenced by the social reforms aimed at removing practices such as sati, where a wife throws herself on the funeral pyre of her husband, and at social discrimination based upon untouchability, as well as demands for the emancipation of the lower classes, which swept across India. In 1894, the kingdom passed laws to abolish the marriage of girls below the age of eight. Remarriage of widowed women and marriage of destitute women was encouraged, and in 1923, women were granted the permission to exercise their franchise in elections. There were, however, uprisings against British authority in the Mysore territory, notably the Kodagu uprising in 1835 (after the British dethroned the local ruler Chikkaviraraja) and the Kanara uprising of 1837. The era of printing, heralded by Christian missionaries, resulted in the founding of printing presses across the kingdom. The publication of ancient and contemporary Kannada books (such as the Pampa Bharata and the Jaimini Bharata), a Kannada-language Bible, a bilingual dictionary and a Kannada newspaper (called Kannada Samachara) began in the early nineteenth century. Aluru Venkata Rao published a consolidated Kannada history, glorifying the achievements of Kannadigas in his book Karnataka Gatha Vaibhava. Native Yakshagana as well as classical English and Sanskrit plays influenced the Kannada stage and produced famous dramatists like Gubbi Veeranna. The public began to enjoy Carnatic music through broadcasts made over public address systems set up on the palace grounds. 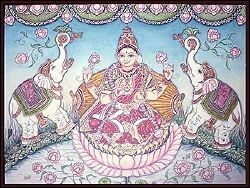 Mysore paintings, which were inspired by the Bengal Renaissance, were created by artists such as Sundarayya, Ala Singarayya, and B. Venkatappa. 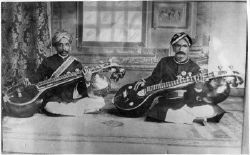 The era of the Kingdom of Mysore is considered an important age of Kannada literature, especially in the field of musical treatises, compositions and dramas. Not only did the Mysore court patronize famous Brahmin and Virashaiva writers and composers, but the kings themselves were accomplished in the fine arts and made important contributions. Though traditional literature in philosophy and religion was written, a wave of writings in new genres such as chronicles (vamshavali), biographies, histories, encyclopedias, novels, dramas, and treatises on music and musical compositions became popular. 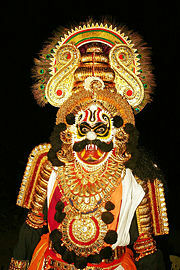 A unique and native form of poetic literature with dramatic representation called Yakshagana gained popularity in the eighteenth century. Another remarkable development of the later period was the influence of English literature and classical Sanskrit literature on Kannada literature. Govinda Vaidya, a native of Srirangapatna, wrote a eulogy of his patron King Narasaraja Wodeyar called Kanteerava Narasaraja Vijayam. Written in sangatya meter (a composition meant to be rendered to the accompaniment of a musical instrument) and melodious Kannada, the book describes the lifestyle of the kingdom, the king's court, the popular music and the types of musical compositions of the age in 26 chapters (sandhis). King Chikka Devaraja Wodeyar, the earliest composer of the dynasty, received the honorific Sahitya Vidyanikasha Prastharam for his interest in the fine arts. To him is ascribed the famous treatise on music in Kannada called Geetha Gopala. Though inspired by Jayadeva's Sanskrit writing Geetha Govinda, it had an originality of its own and was written in saptapadi metre (seven beats per line). This was the first writing that propagated the Vaishnava faith in the Kannada language. Famous names in Kannada literature during the seventeenth century include the brahmin poet Lakshmisa, the Jain grammarian Bhattakalanka and the Virashaiva poet Sarvajna. Female poets also played a role in the development of Kannada literature, with Cheluvambe (the queen of Krishnaraja Wodeyar I), Haridasa Helavanakatte Giriyamma, Sri Rangamma (1685) and Sanchi Honnamma (author of Hadibadeya Dharma) writing notable Kannada-language works. The rule of King Kanteerava Narasaraja Wodeyar II is considered the age of Yakshagana compositions. A polyglot, he authored 14 Yakshaganas in various languages, though all are written in Kannada script. King Krishnaraja Wodeyar III was a prolific writer in Kannada, for which he was called Abhinava Bhoja. Over 40 writings are attributed to him; his poetical romance called Saugandika Parinaya written in two versions, a sangatya and a drama, is still popular. In this story, the sage Durvasa curses Devendra (the Hindu god Indra) to be born as Sucharitra, the son of Sugandharaya, the king of Ratnapuri. Devendra's wife Shachidevi takes birth as Sougandhika and marries Sucharitra. Wodeyar III wrote three landmark musical treatises, called Sri Tatwanidhi (with iconography), Swara Chudamani and Sara Sangraha Bharata. Basavappa Shastry, a native of Mysore and a luminary in the court of Kings Krishnaraja Wodeyar III and Chamaraja Wodeyar IX, is known as Kannada Nataka Pitamaha ("the father of Kannada theatre"). Shastri composed the first state anthem of the Mysore Kingdom, Kayou Sri Gowri, for the coronation of Chamaraja Wodeyar IX. Because of his proficiency in Kannada and Sanskrit and his knowledge of the fine arts, he was appointed the head of Chamaraja Nataka Sabha (a drama consortium) in 1882. Basavappa Shastry authored dramas in Kannada and translated William Shakespeare's "Othello" to Shurasena Charite with the help of D.C. Subba Rao. Among his translations from Sanskrit to Kannada are Kalidasa, Abhignyana Shakuntala, Vikramorvasheeya, Malavikagnimitra, Uttara Rama Charite, Chanda Koushika Nataka, Malathi Madhava and Ratnavali. Though most Mysore kings patronized music and many were noted musicians themselves, the golden age of Carnatic music in the Kingdom started from the reign of King Krishnaraja Wodeyar III. The reign of Krishnaraja Wodeyar IV is considered a particular high point. During this time, Mysore developed a distinct school of music which gave importance to raga and bhava and became a seat of Carnatic music. Mysore Vasudevacharya was a musician and composer born on May 28, 1865, in Mysore. He holds the unique distinction of being patronized by four generations of Mysore kings, and of being court musician to three of them. A master of both Carnatic and Hindustani raga, he delivered the opening Sanskrit shloka at the Indian National Congress convention at Belagavi in 1924, represented Mysore in the "Akhila Bharateeya Sangeeta Parishat" concert held in Gwalior and earned the titles "Sangeeta Shastra Ratna" ("gem of music") and "Sangeeta Shastra Visharada." Credited to him are compositions in Sanskrit and Telugu under the pen name Vasudeva and two books in Kannada. H.L. Muthiah Bhagavatar was a famous musician and composer of this period. A native of Tirunelveli (in modern Tamil Nadu) and a student of Samabasiva Iyer in Tiruvayyar, he was appointed as a court musician at Mysore in 1927 and was honored with the title "Gayaka Shikamani" by his patron King Krishnaraja Wodeyar IV. Four hundred compositions in Sanskrit, Kannada, Telugu and Tamil under the pen name "Harikesha" are credited to him. In addition, he wrote an important treatise on music in Tamil called "Sangeeta Kalpadrumam," and a biography of Tyagaraja, "Srimat Tyagaraja Vijaya," in Sanskrit. He is considered one of the most important composers of the post-Tyagaraja period. 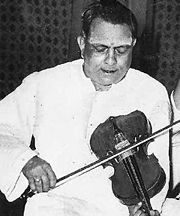 T. Chowdiah (1895 – 1967), a noted personality in the field of Carnatic music, born in Tirumakudalu Narasipura, near Mysore, studied under the well-known musician Bidaram Krishnappa, and emerged as an accomplished violinist. The ambidextrous Chowdiah is known to have played music with all the famous Carnatic musicians of his day. In 1939, he was appointed court musician by King Krishnaraja Wodeyar IV and received such titles as "Sangeeta Ratna" and "Sangeeta Kalanidhi." He is credited with many compositions in Kannada, Telugu and Sanskrit under the pen name "Trimakuta". 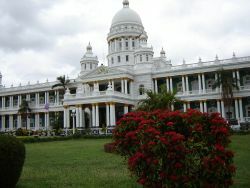 The Lalitha Mahal Palace was built in 1921 by E.W. Fritchley under the commission of King Krishnaraja Wodeyar IV. The architectural style is called "Renaissance" and exhibits concepts from English manor houses and Italian palazzos. The central dome is believed to be modeled on Saint Paul's Cathedral in London. Other important features are the Italian marble staircase, the polished wooden flooring in the banquet and dance halls, and the Belgian cut glass lamps. The Jaganmohan Palace was built mostly in the Hindu style in the middle of the nineteenth century by King Krishnaraja Wodeyar III. Noted for its ornamental pavilion (called the Wedding Pavilion), this palace was the marriage site of King Krishnaraja Wodeyar IV. The palace has an elegant façade with three large entrances. The molded and bracketed entablature supports miniature elaborate towers that look like temples and serve both as gables and as crest niches. The palace has spacious balconies, stained glass windows, shutters and ventilators. The Jayalakshmi Vilas Palace was built by King Krishnaraja Wodeyar IV in 1905 for the eldest daughter of Chamaraja Wodeyar IX, princess Kumari Jayalakshmammanni. Built in the Corinthian style, it is comprised of a three-winged building with two Corinthian and Ionic columns, regal pediments on the first floor and above the north and east porches, plastered windows, and rich masonry and woodwork. The sculptures of the Hindu goddess Lakshmi on the north side and of the goddess Bhuvaneshwari on the south side are particularly notable. 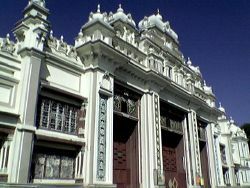 The Karanji Vilas mansion, an Indo-Greek style building, was commissioned in 1902 and completed in 1932. It was built for the second princess, Kumari Krishnarajammanni, and overlooks the Karanji Lake. The Cheluvamba Mansion was built for her sister, the youngest princess, in 1910. An imposing yet balanced structure, its main façade contains twin towers flanking semi-circular columned verandas on the ground and first floors. The king's summer palace, built in 1880, is called the Lokaranjan Mahal, and initially served as a school for royalty. The Rajendra Vilas Palace, built in the Indo-British style atop the Chamundi Hill, was commissioned in 1922 and completed in 1938 by King Krishnaraja Wodeyar IV. Other royal mansions built by the Mysore kings were the Chittaranjan Mahal in Mysore and the Bangalore Palace in Bangalore, a structure built on the lines of England's Windsor Castle. Famous among the kingdom's temples is the Chamundeshwari Temple atop the Chamundi Hill. The earliest structure here was consecrated in the twelfth century and was later patronized by the Mysore kings. 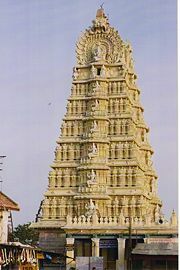 King Krishnaraja Wodeyar III added a Dravidian-style gopuram in 1827. The temple has silver-plated doors with images of deities. Other images include those of the Hindu god Ganesha and of King Krishnaraja Wodeyar III with his three queens. Surrounding the main palace in Mysore, and inside the fort, are five temples, built during various periods. The Prasanna Krishnaswamy Temple was commissioned in 1829 by King Krishnaraja Wodeyar III. It contains sculpted images of Hindu deities, a statue of the king and his queens and a shrine for Sage Atri, with whom the Wodeyar dynasty have a legendary association. The Lakshmiramana Swamy Temple, the oldest of the fort temples, existed prior to 1499. Legend has it that King Raja Wodeyar survived after having been poisoned at the temple because of his faith in Vishnu, the temple's deity. The Trinesvara Swamy Temple, built for the three-eyed god Shiva, has existed since the time of Raja Wodeyar and was renovated by successive kings. The Shweta Varaha Swamy Temple is unique in that it contains many aspects of Hoysala architecture. Built by Purniah, the Diwan of King Krishnaraja Wodeyar III, it is believed to contain structures taken from a then-existing Hoysala temple. The Prasanna Venkataramana Swami Temple, a Vishnu temple containing 12 murals of the Wodeyar kings, was built by Subbaraya Dasa, an officer of King Krishnaraja Wodeyar III, in 1836. Tipu Sultan built the Dariya Daulat Palace in the Dariya Daulat Bhag (literally the "garden of the wealth of the sea") in 1784. Built in the Indo-Saracenic style, the palace is known for its intricate woodwork and paintings. The west wall of the palace is covered with murals depicting Tipu Sultan's victory over Colonel Baillie's army at Pollilur, near Kanchipuram in 1780. One mural shows Tipu enjoying the fragrance of a bouquet of flowers while the battle is in progress. In that painting, the French soldiers' mustaches distinguish them from the cleanshaven British soldiers. The Masjid-e-Ala or Jama Masjid was built by Tipu Sultan in 1784 and has minarets mounted on a tall platform. 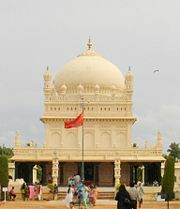 It has two stories and is octagonal in shape, with pigeonholes surmounted by domes. The walls and ceilings are decorated with Persian scriptures in fine calligraphy. ↑ 1.0 1.1 1.2 Suryanath U. Kamath,. A concise history of Karnataka: from pre-historic times to the present (Bangalore: Jupiter books, 2001), 227. ↑ Burton Stein, Vijayanagara (Wiltshire: Cambridge University Press, 1999), 82. ↑ Meera Rajaram Pranesh, Musical Composers during Wodeyar Dynasty (1638-1947 C.E.) (Bangalore: Vee Emm, 2003), 2-3. ↑ Wilks and Aiyangar in Krishnaswami S. Aiyangar, Ancient India: Collected Essays on the Literary and Political History of Southern India (New Delhi: Asian Educational Services, 2004, ISBN 8120618505), 275-276. ↑ 7.0 7.1 Kamath, 2001, 228. ↑ Sethu Madhava Rao in Kamath, 2001, 229. ↑ 9.0 9.1 Pranesh, 2003, 19. ↑ 11.0 11.1 11.2 Kamath, 2001, 230. ↑ 13.0 13.1 13.2 13.3 Kamath, 2001, 233. ↑ P.N. Chopra, T.K. Ravindran, and N. Subrahmanian, History of South India (Ancient, Medieval and Modern) Part III. (New Delhi: Chand publications, 2003, ISBN 8121901537), 76. "A military genius and a man of vigor, valor and resourcefulness"
↑ 15.0 15.1 15.2 15.3 Kamath, 2001, 232. ↑ Chopra et al., 2003, 73. ↑ Chopra et al., 2003, 77. "By temperament and training, Tipu was a great military leader and conqueror"
↑ Chopra et al. 2003, 81-82. ↑ A wise and benevolent promoter of industry and opulence- Gen Wellesley in Kamath, 2001, 249. ↑ 22.0 22.1 Kamath, 2001, 250. ↑ B. Lewis Rice, Report on the Mysore census (Bangalore: Mysore Government Press, 1881), 3. ↑ M. Rama Jois, Legal and constitutional history of India ancient legal, judicial and constitutional system (Delhi: Universal Law Pub. Co., 1984), 597. ↑ K. Puttaswamaiah, Economic development of Karnataka - a treatise in continuity and change (New Delhi: Oxford & IBH, 1980), 3. ↑ The Mysore duo Krishnaraja Wodeya IV & M. Visvesvaraya. India Today Retrieved September 20, 2016. ↑ 32.0 32.1 Kamath, 2001, 251. ↑ 33.0 33.1 Kamath, 2001, 252. ↑ 35.0 35.1 Kamath, 2001, 254-255. ↑ 36.0 36.1 36.2 Kamath, 2001, 257. ↑ 38.0 38.1 Kamath, 2001, 258. ↑ Nilakanta K.A. Sastri, A history of South India from prehistoric times to the fall of Vijayanagar (New Delhi: Indian Branch, Oxford University Press,. 2002, ISBN 0195606868), 297. ↑ 41.0 41.1 Chopra et al., 2003, 123. ↑ M.H. Gopal, in Kamath, 2001, 235. ↑ Chopra et al., 2003, 124. ↑ Chopra et al., 2003, 132. ↑ Chopra et al., 2003, 134. ↑ King Raja Wodeyar was a devotee of Vishnu (Pranesh, 2003, 5). ↑ King Chamaraja Wodeyar VI wrote his own version of the Valmiki Ramayana, but protected all schools of Hinduism and Jainism (Pranesh 2003, 6). ↑ Kamath, 2001, 229-230. "King Chikkadevaraja Wodeyar was a Sri Vaishnava and composed poems in praise of Cheluvanarayana Swamy, the deity of temple at Melkote"
↑ Jain and Jain, 1953, 56. ↑ Jain and Jain, 1953, 58. ↑ 65.0 65.1 Sastri, 1955, 396. ↑ Mohibul Hassan in Chopra et al., 2003, 82, part III. ↑ Chopra et. al., 2003, 82. ↑ Chopra et al., 2001, 187. ↑ Josephus Wicki in Documenta Indica (1540–1549) and Zinadim in Historia dos Portuguese no Malabar cited in Chopra et al., 2003, 187. ↑ Chopra et al., 2003, 188. ↑ Chopra et al., 2003, 190. ↑ Chopra et al., 2003, 191. ↑ Chopra et al., 2003, 192. ↑ Chopra et al., 2003, 185. ↑ Chopra et al., 2003, 186. ↑ Chopra et al., 2003, 196-197, 202. ↑ 87.0 87.1 Kamath, 2003, 283. ↑ Pranesh, 2003, preface (i). ↑ R. Narasimhacharya, History of Kannada Literature (New Delhi, Madras: Asian Educational Services, 1988, ISBN 8120603036), 23-26. ↑ 99.0 99.1 Pranesh, 2003, 37-38. ↑ 102.0 102.1 Pranesh, 2003, 55. ↑ Pranesh, 2003, xiii in author's note. ↑ Satish Kamat, Metro Plus Bangalore, July 11, 2002,The final adjustment, The Hindu, July 11, 2002. Retrieved September 20, 2016. ↑ Pranesh, 2003, 140, 147. ↑ 119.0 119.1 Afried Raman, Bangalore - Mysore (Bangalore: Orient Longman, 2003, ISBN 0863114318), 82. ↑ 120.0 120.1 Bradnock, 2000, 315. ↑ 121.0 121.1 121.2 Raman, 1994, 87-88. ↑ Robert Bradnock, South India Handbook - The Travel Guide (Footprint Travel Guide, 2000, ISBN 1900949814), 294. ↑ 124.0 124.1 124.2 124.3 124.4 Raman, 1996, 83. Aiyangar, Krishnaswami S. Ancient India: Collected Essays on the Literary and Political History of Southern India. New Delhi: Asian Educational Services, 2004. ISBN 8120618505. Bradnock, Robert. South India Handbook - The Travel Guide. Footprint Travel Guide, 2000. ISBN 1900949814. Chopra, P.N., T.K. Ravindran, and N. Subrahmanian. History of South India (Ancient, Medieval and Modern) Part III. New Delhi: Chand publications, 2003. ISBN 8121901537. Jain, Surendranath Shripalji, and Sarojini Surendranath Jain. Bahubali of Jainbadri (Shravanabelagola) and other Jain Shrines of Deccan. Shravanabelagola: S.D.J.M.I. Managing Committee, 2005. Pranesh, Meera Rajaram. Musical Composers during Wodeyar Dynasty (1638-1947 C.E.) Bangalore: Vee Emm, 2003. Narasimhacharya, R. History of Kannada Literature. New Delhi, Madras: Asian Educational Services, 1988. ISBN 8120603036. Raman, Afried. Bangalore - Mysore. Bangalore: Orient Longman, 2003. ISBN 0863114318. Rice, B.L. Mysore Gazatteer Compiled for Government-vol 1. New Delhi, Madras: Asian Educational Services, 2001. ISBN 8120609778. Rice, B. Lewis. Report on the Mysore census. Bangalore: Mysore Government Press, 1881. Sastri, Nilakanta K.A. A history of South India from prehistoric times to the fall of Vijayanagar. New Delhi: Indian Branch, Oxford University Press, 2002. ISBN 0195606868. Stein, Burton. The New History of Cambridge History of India: Vijayanagara. Foundation Books, 2006. ISBN 8185618461. Stein, Burton. Vijayanagara. Wiltshire: Cambridge University Press, 1999. ISBN 0521266939. History of "Kingdom of Mysore"
This page was last modified on 26 October 2016, at 16:04.